I have a client with a three phase supply & want to connect a single phase inverter with change over switch. I have attached a wiring diagram of what I would like to do. Last edited by Tonye; 11-Feb-19 at 05:42 PM. Without knowing the size of the incoming supply and the size of the inverter - In theory I don't see a problem with your drawing besides the other odds and ends that need to accompany alternative supply , indicator lights, charge circuit etc . In practice I would not do it and would prefer to install separate DB with the inverter circuits that are going to be used . SANS 10142 - 7.12.2.4 does not allow you to switch off circuits manually so the cost to install extra relays etc to drop the load to match the inverter is going to come to the same time and cost as creating a separate DB .You also run the risk that somebody forgets about the inverter and connects a 3 phase piece of equipment up. The risk is to high to do wahat you are wanting to do , In my opinion. I am aware of indicator lights, charge circuits, notices etc.. This is for a std residential property & all loads are single phase. There is no 3phase outlets or other 3phase connections on the premises. One question is, would the 3phase E/leakage still function when supplied with single phase. However it was relatively easy to move the circuits over due to the flush design of the DB. On this installation the DB is raised & would prove difficult to move the circuits. I am also trying to minimise costs. After speaking to a few colleagues, there seems to be a debate on whether the Neutral on the 3 phase connection should also go through the changeover switch. The layout will look something like this. I still feel that you will be breaking the regulations by exceeding the inverter capabilities and the cost savings you are trying to achieve are going to come back to bite later. My interpretation of this regulation is the following. Last edited by Tonye; 18-Feb-19 at 11:10 AM. Most of the regulations are written to make practical sense and I generally try to read it with the hope of trying to understand why. If as you suggested they were trying to ensure that you put the correct overload protection in they would have just stated "utilized suitable protection ". The overload protection is already dealt with elsewhere in the code.Using automatic also indicates that something else is being said as there is no manual overload protection system that I am aware of .Well acceptable manual system anyway. In this particular statement they are requesting that you disconnect any load that may exceed the inverter rating (parts of the installation) and then they add in automatically vs manually switching off of circuits. To me it makes sense otherwise Jo Soap switches to alternative supply and the supply trips which means he has no supply and then you are relying on him to know enough so as to reduce the load to within the capabilities of the inverter and at the same time avoid multiply overloads on the inverter within a sort space of time. The automatic I would regard as a contactor dropping out the majority of circuits or some sort of load shedding relay. In shopping centers we generally drop out the aircon plant rooms when we switch to generator by means of a contactor wired to mains voltage.That way we ensure that we do not rely on Joe to switch off the aircon manually but automatically take the aircon supply off the generator - It would be obvious and covered elsewhere in the regulation that my cables and circuit breaker rating must be suitable selected for the generator. At the moment you are trying to save the client money. The client is going to use the system , find another contractor down the line for some obscure reason and the contractor is going to point out all sorts of faults with your system.You may then be forced to come back and repair at your own cost as you sold a system to be working correctly to the regulations. A worse scenario is that the client does not come back to you but bad mouths you to any potential customer and you wondering why you are not getting work in the area. I have learnt through the years that saving the client money by taking grey area short cuts never works. I would rather be know as the contractor that does things correctly, follows the regulations minimum standards and still has his own standards on top of the minimum but is a bit expensive - then the alternative, good contractor that takes shortcuts to save you money but never quite works seamlessly. The person spending money on having an inverter installed does not want the hassle of trying to figure out what can stay on and what can stay off every time there is load shedding. He just wants to sit and carry on watching his TV show with minimal interruption.Similar in an office environment. This is not about taking grey area short cuts, minimum regulation standards, or my own standards. This is about finding affordable solutions for clients which meet all regulation standards and my standards. I understand when it comes to large commercial installations, high load equipment is automatically disconnected when running off an inadequate alternate power source, as Joe Soap would probably not even know where to turn off said equipment. However this is a residential property. There are no individual loads which will exceed the capacity of the alternate power supply. However a combination of loads would. Scenario with Eskom power on. The total load of the installation trips the main breaker. Which circuits or appliances does Joe soap turn off. Even with a sub Db the total load could exceed the alternate supply capacity & again which circuits does Joe soap turn off. My client (not Joe Soap) has a gas hob & is looking at installing a gas geyser to make provision for longer power outages. The system I am installing will be adequate to feed the other circuits, provided the total load does not exceed the alternate power supply capacity. Should the total load exceed the capacity, which circuits should be automatically disconnected? Here is the irony, Our national grid (Eskom) which supposedly provides 40MW does not have the capacity (Load Shedding)to supply the installation but the alternate supply must. The cost to move circuits to a sub DB which still doesn't guarantee tripping due to the total load, or to make provision to automatically disconnect certain loads in a residential DB (which normally do not have the space for automatic disconnecting devices), or installing an unaffordable inverter battery system to cope with the whole installation just doesn't make sense. The client is going to use the system , find another contractor down the line for some obscure reason and the contractor is going to point out all sorts of faults with your system. Last edited by Tonye; 18-Feb-19 at 09:33 PM. 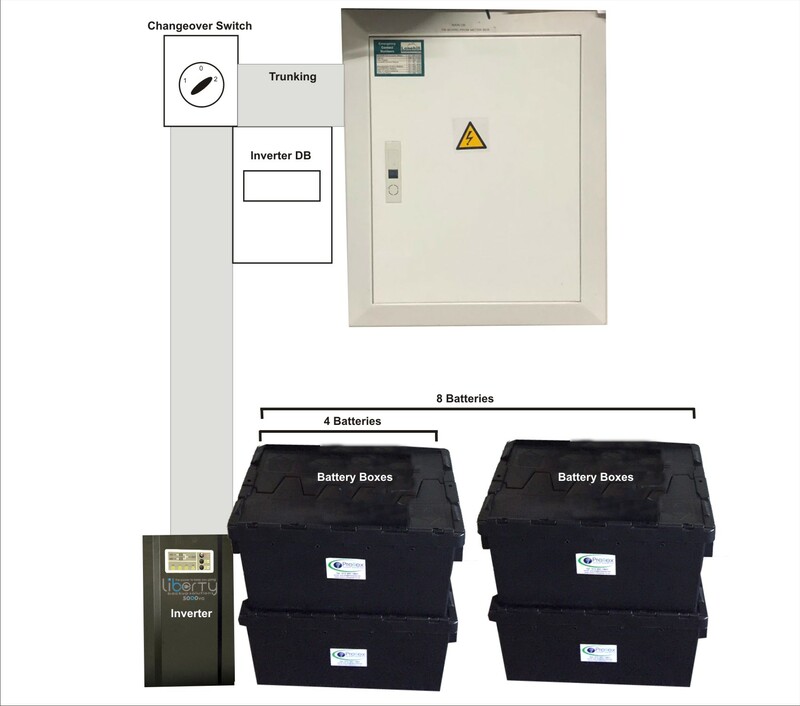 If you install a sub DB with circuits that will be fed from the inverter, that will be within the current rating (eg light circuit or two , router, TV,DSTV etc ) you do not need to install a change over switch and when the Eskom supply drops away the change to alternative supply will be seamless . If you are going to put in extra circuits that may exceed the load of the inverter than install a loadshed mointoring device that can drop circuits automatically . capacity of the required electricity supply. but the method is not to be regarded as an exact method. installations that need special consideration. On Domestic single phase supplies that are running close to tripping you would install a load shed relay between a stove and geyser for example to prevent nuisance tripping. Experience has taught me that the client never does what he says he is going to do. The regulations ask us to estimate the load and then specify the supply. Unfortunately with inverters it is a money story and the client only wants to spend X amount. Then we need to make sure the load does not exceed the inverter and automatically disconnects load if the capacity is going to be exceeded. To me the regulations are pretty clear. No where do I find in the regulations that I may manually disconnect load if the client does not have money to pay for automatic disconnection.Maybe I am reading incorrectly. I have a comment about automatic changeovers. The regulations clearly state that in a three phase installation all phases and neutral shall be switched with regards to alternative supplies I have yet to see any automatic changeovers do this. Single phase generator feeding 1 phase of 3 phase db - discuss. How to CoC a changeover switch? ?